One of the most influential French cultural theorists of the twentieth century, Jacques Lacan (1901-1980) is responsible for revival of interest in Freud, notably among the feminists who saw Freud as a typical MCP- Male Chauvinist Psychologist. While most of Jacques Lacan’s writing is willfully obscure and irritatingly playful, one can approximately discern the general thrust of his theory. Lacan’s emphasis is on the anti-humanistic implication of decentered and split human self in Freud’s psychoanalysis. Freud’s theory replaced the idea of coherent and autonomous human self (which is a humanist idea) with the idea of human ego existing on the fringe of the all powerful Unconscious- the huge area of human self existing outside of human awareness. In Freud’s view, the car of human life is driven from the back seat of Unconscious. Freudian theory, in Lacanian interpretation, is chiefly about decentering or marginality of human self in relation to itself. This notion of decentering ties up with the similar ideas in Heideggerian existentialism. Heidegger’s remark ‘it is language that speaks, not man’ sums up this position of the decentered human self in relation to language. Lacan draws attention to the fact that we tend to misconstrue (méconnaissance) ‘I’ of our linguistic utterance (enunciation) - as in “I am going home” (which is grammatically in subject position of enunciation) for the self of the speaker (‘enounce’). This gap between the speaker’s self and the linguistic ‘I’ is due to this decentering of human self in relation to language. Just like the structure of language displaces man by being the real producer of meaning instead of human soul, the unconscious displaces the humanist idea of autonomous coherent self which knows –’the cogito’. Lacan also notes that as any use of language assumes the presence of the audience, the ‘self’ and ‘the other’ split is built into language. That is, we always assume the presence of someone when we use the language. This someone may be oneself as when we talk to ourselves or when we write things like diaries for one. This means the use of language (as in thinking) results in the split between the self (the addresser) and the other (addressee) who might be the same person. It is this conception of decentering and splitting of human self which is expressed by Lacan’s widely quoted dictum, ‘ The Unconscious is structured like language’. It implies that the laws governing the unconscious and the laws governing human language are analogous and that unconscious functions in much the same way as language does. Lacan draws upon the works of Saussure and Roman Jakobson on the mechanism of language to demonstrate that the mechanism of unconscious also functions on similar lines. For instance, the dream work described by Freud as comprising of mechanisms of displacement, condensation and symbolism is in Lacan’s view, actually ‘language work’. Drawing upon Roman Jakobson’s work on aphasia and poetics, Lacan notes that the mechanisms of dream work like the processes of condensesation, displacement and symbolism are actually analogous to ‘tropes’ of language like metaphor and metonymy. In Lacan’s view, the splitting of human self and the decentering occurs when human beings acquire the symbolic cultural system represented by language. This system as noted by Saussure is the system of differences based on binarisms like the self and the other, man and woman. With language acquisition, the human beings position themselves within this system of differences and assume identity and the sense of self and the other. What is lost in the process of differentiation is the sense of oneness and union with our mothers and we try to regain it in our lives. This is possible only at the level of imagination or the Imaginary where the distinctions and differences are believed to be non-existent. 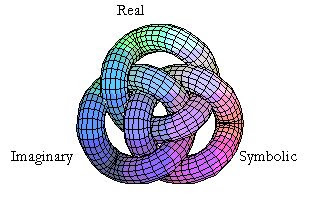 Hence human beings operate on two levels in their lives: the Imaginary and the Symbolic. These levels can only be accessed through human language and hence are seen as ‘registers’ in psychoanalytical theory. The humans can articulate desire only through language, the Symbolic domain and as Lacan points out the structure of language is the structure of signifiers where one signifier perpetually leads to another signifier. That is, the meaning of one word is another word or another set of words. Consider a dictionary entry on a difficult word. The entry itself is composed of words whose meanings lay elsewhere. This means that the meaning does not lie ‘in the signifier’ but elsewhere. The signifier ‘lacks’ meaning and it is this ‘lack’ which makes the movement from one signifier to another possible. This movement from one signifier to another driven by ‘lack’ becomes the movement of ‘supplemantarity’ and difference in Derrida’s philosophy. Lacan points out that the human desire is a combination of ‘the demand’ and ‘the need’. The need which is biological can be gratified, while the demand which can only be articulated through language can never be satisfied. The demand for something (this thing is a signifier) can lead only to another signifier which leads to another signifier ad infinitum. Hence, the Lacanian dictum: ‘All speech is a demand and all demand is a demand for love.’ The demand which can never ever be fulfilled as each signifier ‘lacks’ meaning and links to another signifier. Lacan notes that desire is a movement from one signifier to another and hence ‘syntagmatic’ or ‘metonymic’ while the movement of neurosis is the movement of substituting one thing for another (‘a symptom’ for an unconscious wish) and hence ‘paradigmatic’ or ‘metaphorical’. In Lacanian psychoanalysis, the phallus is ‘the privileged signifier’, as language and culture in patriarchy function under the ‘Law of Father’. The Phallus, being a signifier also ‘lacks’ positive meaning. The idea of the phallus as a privileged signifier comes from Lacan’s reinterpretation of Freud’s oedipal phase or phallic phase of psychosexual development (see the entry on Freud). 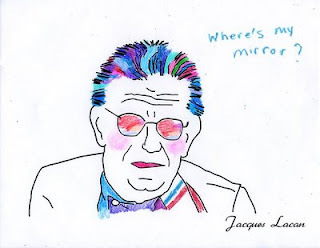 While most of the ideas discussed above are later development in Lacan’s philosophy, his ‘The Mirror Stage as Formative of the Function of the I’ (Ecrits, 1977) is an early essay dealing with question of human identity formation. In contrast to traditional humanistic notion of identity as being innate and organic to human self, Lacan notes that it is formed in the process of identification with something which is not self and something which is outside of self. Lacan’s views on identity formation resemble the Hegelian notion of dialectic between the self and other as expressed in his ‘Master-Servant’ relationship. The Mirror Stage, according to Lacan, results in child’s recognition and discovery of self as a reflection. This misidentification of reflection for self is central to Lacan’s theory. It implies that ‘identity’ is a product of misidentification and misconstruction (méconnaissance) rather than discovery of ‘true’ or ‘real’ self. Lacan gives instances from neurology and zoology where visual knowledge of similar species is necessary for full biological development of the organism (as in pigeons and locusts). Lacan also points out how this ‘specular I’ contributes to development of motor skills in a child. Hence this méconnaissance is necessary for biological development of an organism. The notion of mirror stage in Lacan also brings to fore his disagreement with Freud. While Freud sees the oedipal phase or phallic phase as being crucial to identity, including the gender identity, Lacan points out that the processes of identity formation start even earlier at the pre-linguistic and pre-phallic stage of psychological development. This idea in Lacan also prefigures his theorization of ‘the Imaginary’ register in psychoanalysis. The Imaginary is the register where human beings are able to imagine themselves as undifferentiated totality and where the complete intimacy with the other is possible. Hi! I am a special educator from Mumbai. I was translating a checklist for screening children with learning disability into Marathi. I was wondering if you could help me translate 'motor skills' into Marathi. I know, 'skills' is kshamata....but the word 'motor' stumps me! Thanks, in advance! Really very happy to say, your blog is very interesting to read. I never stop myself saying something about it. You’re doing a great job. Keep it up.